Way back in January I reviewed Funky Buddha's Maple Bacon Coffee Porter which was a sweet and delicious porter. So, naturally when I heard about an imperial version aged in bourbon barrels, I had to get my hands on it. The standard MBCP came in at 6.40% and this beast is nearly double the abv plus the addition of several months of aging. Pours pitch black, but you can barely get dark brown on the edges if you tilt it and hold it up to the light. Got less than a finger of light brown head. The aroma is bursting with maple syrup and coffee. This is truly MBCP cranked up as it is so much more pungent on just the initial whiff. After that there are subtle vanilla and oak from the barrel, but no real bourbon component. Bourbon finally shows up on the taste. It's quite sticky, but also sweet and smooth. It's not just the bourbon that sticks either as that maple syrup is so bold just like the standard MBCP. There's a small alcohol taste to this, but a lot of the sweetness helps cut into it. In relation to MBCP, I recall that one having a stronger, salt and smoke character, but I don't get that here as I think the bourbon barrel has neutralized those flavors. I don't necessarily miss them since the abundance of maple syrup makes up for it, but I would have liked that piece if the puzzle too. I'm surprised at the amount of bourbon on the taste considering I got NONE of it on the aroma. It sticks around like crazy and lingers on the finish. I mean you can call this an Imperial Porter or an Imperial Stout, but it's apples to oranges with this beer. It's thick, viscous, and coats your mouth. I don't care what its classification is, but it feels perfect, especially at 12.00%. It's also very soft and smooth on the tongue. There was the aforementioned alcohol taste, but it's minor and won't at all prevent you from enjoying this. 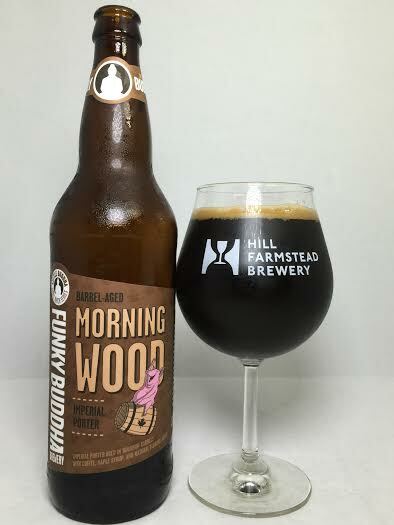 Morning Wood is nearly twice the abv of Maple Bacon Coffee Porter and it tastes and feels as such. Now, here's my criticism of this beer (Stop booing me!). While I love, LOVE the maple syrup, coffee, and bourbon, I don't think they are working off one another as perfectly as they should. As I drink this, I am saying to myself: "Oh, there's maple.Oh, there's coffee. Oh, there's bourbon". As a total package (not Lex Luger), it falls JUST short of blending everything together in the same way that other world-class barrel-aged beers do. All of that being said, all the flavors present are superb and as basically a Double MPCB with bourbon, this is fantastic.